Although home colouring kits can offer a quick and easy solution to hair dying, sometimes a visit to the salon is your best bet. The key is knowing when you actually need the services of a salon for hair colouring and what you need to ask when you get there for the best results. Although a home colour kit is effective for colouring some types of hair, there are instances when you will need the advice and expertise of a professional stylist to get the best look and most healthy outcome. If you want a drastic change or are going more than three shades lighter or darker. Changing your hair colour from blonde to black, black to blonde, or any other combination that will result in much lighter or darker hair will call for some strong chemicals and a knowledgeable hand. These types of drastic hair colour changes are best left to the professional, in order to avoid damaging hair or getting a horrible looking result. You have unhealthy hair. Excessive styling, over-washing, and too much sun exposure can all leave your hair feeling dry and brittle. If your hair has been damaged from too much blow-drying, too much heat exposure, or too many shampoos, the shaft won't take the colour as well. Plus, dry, brittle hair is more prone to breakage and falling out when chemicals are applied. In this case, you will need a stylist who can choose milder chemicals and still give you the results you are hoping for. If you have chemically curled or straightened your hair. Hair that has already been processed chemically, such as having a perm, is more susceptible to damage from the harsh chemicals in hair colour. 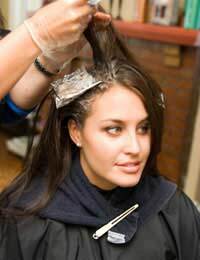 The stylist, however, can take your past hair treatments into account and choose hair dyes that will nourish you hair. If you have already coloured your hair and the results were less than spectacular. Never try to fix a bad dye job at home. The previous colouring will have stripped hair of important nutrients, dried out the hair shaft, and made the strands more susceptible to breakage. Only a professional stylist is capable of colouring recently coloured hair and getting the right colour without further hair damage. If you have healthy, colour ready hair but still want to use the services of a salon there are a few things you need to know before you make that appointment. By being better prepared for your visit you can ensure the best results and avoid hair colour disappointment. First and foremost you should always call ahead and ask about price. While a good, professional hair colour service will never be cheap, the price does fluctuate based on the scale and reputation of the salon. Knowing the cost upfront will help you avoid a big shock once the colour is done. Second, if using a new salon you should always ask for the most experienced colour stylist. The more colours a stylist has done, and the greater his or her repeat customers, the more likely you will be to get the exact look you want. Third, you should ask about the salon's service guarantee. Some salons will gladly fix a colour free of charge just because the customer isn't 100% happy with the look, but others will only give a free fix if the colour was defective or the hair was damaged in the process. Finally, you should always bring a picture of the colour you are hoping for to discuss with your stylist. This will help cut down on disappointment and ensure that the stylist understands exactly what you are asking for. Aside from convenience, necessity, and the "good look" guarantee, there are a few other advantages to getting a salon colouring. Professional colourists are trained to work many shades and can more readily help you choose the colour that is right for your hair type and complexion. Plus, if your dream colour doesn't exist a stylist can mix colours until you find the perfect hue. Another advantage to choosing salon colouring is the advice your stylist can give. Professional colourists can offer tips and suggestions for keeping hair colour brighter and truer for longer periods of time. Plus, they can recommend hair products that will nourish your colour treated hair and help you keep it looking healthy and beautiful. Changing your hair colour can be a very important decision. If you choose the services of a salon you will definitely have a greater chance of being happy with the results.